For many of the flavors and fragrances in the market today, a food or drinks manufacturer has the choice between natural and synthetic variants. With the naturally sourced product often being more expensive, the synthetic counterpart is used by many companies. 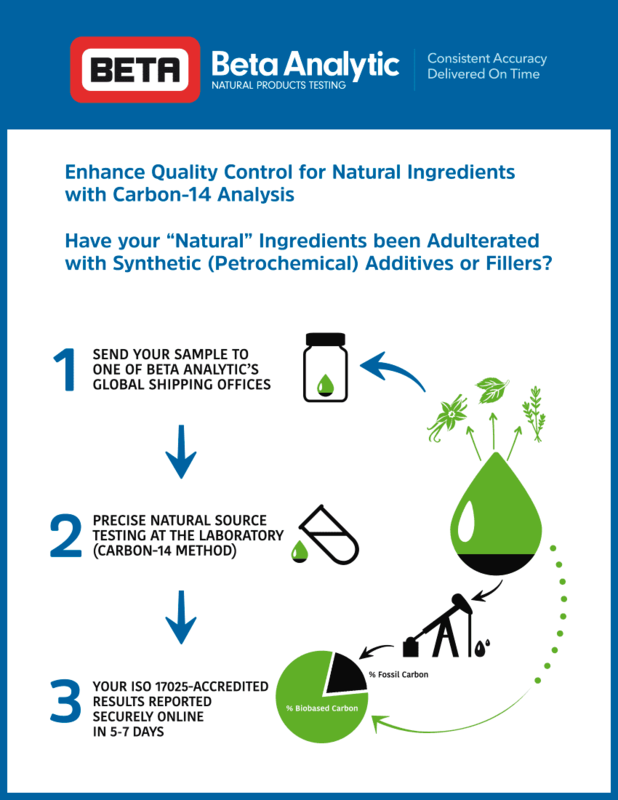 Biobased content testing (Carbon-14 analysis) offers a means to distinguish between these two sources: natural or synthetic. Synthetic fragrances and flavors are usually manufactured from mineral sources such as petroleum. Fossil fuels, like petroleum, were formed millions of years ago and are therefore depleted in Carbon-14. By contrast naturally sourced materials will have a Carbon-14 content similar to that of modern-day plants. Therefore by measuring the Carbon-14 content of flavors and fragrances, it can be determined whether the material is naturally or synthetically sourced or if a reported 100% naturally sourced flavor or fragrance has been adulterated. Vanilla is very popular in the flavor and fragrance industry. Due to a high demand and low supply, it is very expensive. Most products use synthetic vanilla, the most common forms are lignin vanillin and ethyl vanillin. Biobased content testing is able to distinguish vanilla bean extracts versus vanillin sourced from petrochemical derivatives. The test cannot determine if vanilla is sourced from vanilla beans or from other botanical precursors. Carbon stable isotope analysis is needed to further identify the source material. Caffeine is a giant in the food and drinks industry, be it in coffee and tea or soda. In recent years, there has been an ever-growing demand for caffeinated drinks including energy drinks, sports drinks and soda. In non-coffee/tea drinks, synthetically produced caffeine provides a cheap source. Through biobased content testing, it can be determined if the caffeine is from a natural or synthetic petrochemical source. Biobased content testing cannot differentiate between the various natural sources of caffeine. Acetic acid has a variety of uses. In a diluted form, it is used as a cleaning agent (vinegar). In the food industry, it is used as an acidity regulator and condiment. To check for adulterated or fraudulent acetic acid, biobased content testing can be used. It can distinguish between naturally sourced acetic acid and the synthetically sourced from petrochemical feedstocks. The use of tartaric acid spans the food industry, from wine and juice to baking. Both the natural and synthetic sources of tartaric acid are used commercially. Biobased content testing can differentiate between the two types and verify which material is naturally sourced. Miami-based Beta Analytic provides fast, high-quality biobased content testing for the fragrance and flavor industry. Biobased content results are reported between 5-7 business days. A priority service is available for results required in 4 business days or less. The ISO 17025-accredited lab reports results according to international standards ISO 16620-2 (biobased carbon content as a fraction of total carbon or total organic carbon) or ASTM D6866. For inquiries, email or call the lab. What solution does Carbon-14 Testing offer to personal care manufacturers? By measuring the carbon isotope levels of the product and comparing it to the reference standards, it is easy to distinguish the natural from the artificial. Natural products are more expensive than their synthetic counterparts. As a result, some companies use artificial alternatives that are usually petroleum-derived. The Food Chemicals Codex includes biobased content using the radiocarbon method as an approved test of authenticity for making claims on labeling for natural food products.